Before you spend extra money purchasing anything new, it is important to be aware of the dorm room essentials. Most families know some of the usual items that college students should bring along into their new dorm room, but it can be difficult to think of everything. Personal items from home will definitely help aid in the transition from home to college campus, but you will need more than old family photo albums and teddy bears to get through your freshman year comfortably. In order to guarantee that you are not forgetting anything essential when making the important move to college life, read on to find a full checklist of dorm items you will need to make your dorm room your new home away from home. When you make the move into a dorm room, you will need to have the appropriate bedding to adorn your new bedroom. Many college dorms have twin extra-long beds, so make sure that you purchase sheets for the appropriate fit. Bring along sturdy bedding items, including comforters, quilts, blankets, and extra pillows that are easy to wash. To ensure that you are not late for your first class, an alarm clock is a must-have if you do not use your phone’s alarm. Due to the limited space, only bring along weather-appropriate clothes and plan to bring more clothes back to school after your first trip home. Since living in a dorm requires sharing a bathroom, it is important to stock up on bath towels, wash cloths, and hand towels that can easily be distinguished as your own. In addition to all necessary toiletries like a toothbrush, toothpaste, soap, shampoo, and your other preferred cosmetic items, it is recommended that you purchase shower shoes and a shower caddy to carry all of your essentials easily to the bathroom. If the bathroom is down the hall, make sure you also have a bathrobe to avoid early morning embarrassment. Making it through your first semester will require that you have all of the essential school supplies needed for success in your classes. Beyond buying textbooks required for each course, purchase a sturdy backpack for carrying these heavy books each day. Of course, bring along your laptop computer, printer, and other electronic necessities to avoid a mad dash to the library. Along with your standard school supplies of pens, pencils, paper, notebooks, and planners, you should have a dry erase board with markers to let people leave you messages. While it is not likely that you will forget your TV or gaming system, you need to remember the other furnishings that will make your dorm room homey. Mini fridges, microwaves, food storage containers, and eating utensils are essentials, especially if you have a communal kitchen space. For decorating your room, you should consider bringing along posters, removable wall mounts, curtains, personal pictures, and rugs for covering the cold vinyl floors. Folding chairs for extra seating, storage units for organization, and lamps for added lighting can also be helpful. 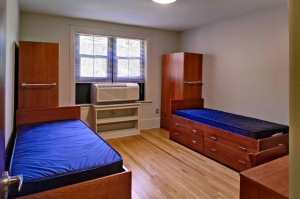 Overall, there are a number of essential items that you will need to furnish your new dorm room, but it is important that you carefully review all regulations produced by your university to understand exactly what items are allowed. Beyond these dorm room essentials, it may be advantageous to talk with a current student at your college to learn other must-haves.